HQ Apex 4-line, Open-Cell Foil. The video below should be watched by anyone wanting to learn more about "Sheetable Foil Kites". It doesn't matter which model you're interested in because almost all sheetable foil kites share some basic design features that allow them to depower. Foil kites are the preferred option for land based kite-sports. The "sheet-able" foil is the ultimate design for getting the maximum wind range. If you've ever adjusted the mainsail on a sailboat or the sail on a windsurfer then you already have experienced "sheeting-in" and "sheet-out" to adjust the power. Sheeting is a windsurfing term which refers to trimming (or adjusting) the "angle of attack" (AOA) of the sail, or in this case a kite. Sheet-in: Pulling your kites control-bar inward and Increasing your kites angle to the wind and generally increasing power. Sheeting-out: Moving your kites control bar out and away from your body and decreasing its angle to the wind, and normally its power. On a Windsurfer, you would trim the sail using your hands to pull-in on the "boom"
With a Kite, you control the sheeting via the Control bar, and/or Trim strap located just above the bar. Standard foil kites regardless of the number of lines, 2, 3, or 4 line have a pre-set "angle of attack" and are not sheetable. Adding a sheetable control bar to a non-sheetable, standard foil, kite would NOT make it into a sheetable kite. With a "standard foil kite" you simply steer the kite right or left just like a 2 or 3 line kite. Sheet-able foil kites first became available in 2003, and they function much like today's "inflatable kites", allowing you to adjust the power of the kite instantaneously simply by moving the control bar closer or further from your body. 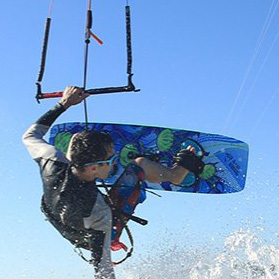 Like everything in life, nothing is perfect and thus there are a few pro's and con's to consider before you decide which kite is best for YOUR needs and budget. "Standard Foil" or "Sheetable (depowerable) Foil Kite"? feel a sheet-able kite would put strain on the budget. You can always get a standard foil for now, and graduate up to a sheetable (depowerable) kite in the future. Want a kite to handle a wider wind range. Want the security of quickly being able to drop excess power. Want "extra power on tap" for boosting more air (jumping). Don't like spending time deciding which size kite to set-up. Don't mind buying a Kite Harness. Once you have decided on getting a sheetable foil... your next question would obviously be "Which specific model?" Will the kite be used only for land based sports such as snow-kiting or kite-landboarding? Is it important that you can use the same kite on the water? If yes, choose a "closed cell" Amphibious Foil Matrixx. Do you normally buy the "top of the line" gear for your other sports? Do you look for high quality gear at the lowest price available? Do you look for gear that's in the middle, good performance, but moderately priced? Is the name brand of high importance to you? 2. High-End Performance, Higher aspect design.